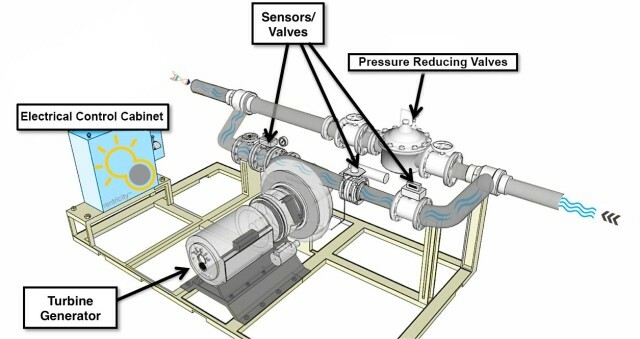 Hydraulic energy harvesting aims to reclaim the wasted energy found in pressurized water pipes. In many cases, water is delivered with an excessive pressure-head that is not needed or even desired. This frequently happens because the water source is elevated, as with a reservoir. In large cities covering extensive geography, pressure needed at the top of a hill may be in harmony with the supplied water but excessive in the lower districts. The classical solution is a pressure reducing valve (PRV) because it's simple and fairly inexpensive. The water's end-user controls the flow by limiting the minimum pressure needed to support it. The PRV does this by restricting the flow through an orifice that's accurately and dynamically controlled through a pressure feedback loop. The PRV's restriction reduces pressure by turning the flow into heat, which can be a complete waste of energy. Recognizing this, a company called Rentricity has developed and formalized a small electrical generation system to harvest this energy as electricity instead of dissipating it as heat. They have built systems that can harvest as little as 5kW and up to 350kW. The energy harvested is either used to offset energy consumed elsewhere in one's facility, sold directly to the grid or used as offsetting credit against the user's monthly utility bill. 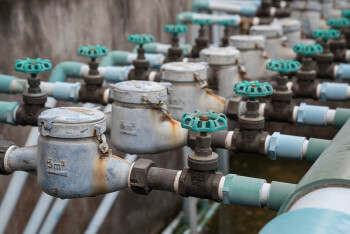 Most of Retricity's installations are done as retrofits, usually to critical systems that are passing considerable amounts of water exceeding several hundred gallons a minute. In such cases, the Rentricity systems are tagged into the existing system around the PRV. This results in extra losses from the water having to make several (typically about 4) sharp turns when it is diverted though the turbine. Ideally, the water should duct straight through the turbine and divert around and through the PRV, which is nothing more than more pressure drop anyway. The company is making clever use of existing potable water equipment by using specific centrifugal water pumps that have acceptable efficiency in a reverse application, where the water drives the impeller instead of the more common situation needed for pumping. For generating, they can use standard induction motors overdriven as induction-generators. Induction-generators are very reliable and easily applied to this task. The company also uses capacitors to aid in power factor correction, which is needed in some induction generator applications. For more information, visit the Rentricity website.